Start the Jewish New Year with smiles by sending the most beautiful Rosh Hashanah bouquets to friends and family around the world. FloraQueen’s international flower delivery service makes it simple to wish anyone “Shanah tova” in over 100 countries across the globe. No matter if you’re sending flowers from Israel to the USA (or vice-versa) we can deliver to wherever your family or friends are celebrating. Delivering online flowers to New York, Los Angeles, Tel Aviv or Haifa, is simple and only takes a few clicks. This year Rosh Hashanah (which translates as “first of the year”) is celebrated between September 9th - 11th in 2018. As one of the high holy celebrations of Judaism, it is a time of festivity and families gathering. If you want to share a surprise gift to decorate the dinner table or just to send a greeting from far away to share the emotion of the festival, a bouquet of flowers is ideal to guarantee smiles. While it is common to give white flowers to offer a spiritually pure message of love, as well as hope for the coming year, other seasonal arrangements of warm coloured roses, gerberas or lilies are equally appreciated. Choose from our online selection of bouquets and select the perfect flowers to match your loved one’s personality now. 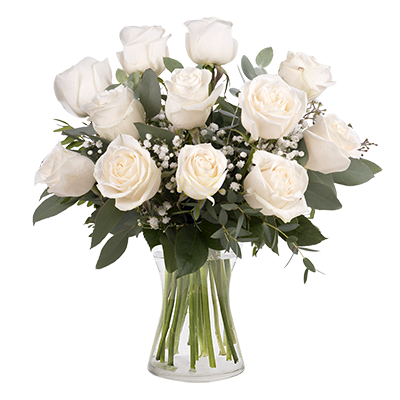 At FloraQueen we deliver bouquets in two distinct ways, depending on where and when you need your flowers to arrive. If you order your bouquet up to 48 hours before delivery and to a destination within reach of one of our bouquet creation centres, your arrangement will be expertly prepared by one of our own master florists, using the freshest flowers. It will then be shipped by courier in our unique branded box, with a little water and nourishment for the journey and will be securely delivered to your loved one’s door. If on the other hand you’re delivering flowers more urgently or during weekends to locations outside the range of our own centres, your bouquet will be entrusted to one of our expert local florists in your delivery destination. They will hand prepare your bouquet with quality flowers and ensure safe delivery of your arrangement to the address of your special someone. *Remember: Many florists are closed in Israel during the high holy days meaning deliveries may not be possible during the days of Rosh Hashanah itself. In this case your bouquet may be delivered on the first working day after the festivities.